In addition to events hosted by the RAs for their floor, UM Housing hosts multiple events throughout the semester for all students living in the Residence Halls. These events vary in topic, and are a great way for students to meet other people across campus. Our monthly Hall Brawls are a social opportunity to engage with other students within the same Residence Hall, as well as with students from other Residence Halls. Each month UM Housing hosts a Hall Brawl for all students living in the Residence Halls. 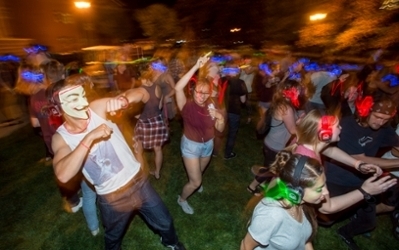 Each Residence Hall staff takes turns hosting these events to allow students to meet others from across campus while building Hall Pride and Spirit. By attending the Hall Brawls, students can build a greater sense of community with their fellow hall-mates while also meeting other students living on campus. UM Housing strives to create positive, inclusive, and respectful living and learning communities that nurture a diverse campus. One way that we do this is by planning and putting on programs that focus on topics of social justice. Each semester, UM Housing works with a group of student staff members to plan these programs. UM Housing also partners with Undergraduate Advising, Career Services, and Student Wellness through the Curry Health Center to offer all Residence Hall students more programming focused on the academic needs of students. Programs provided by this collaboration include a Resource Fair, Information on Spring Registration, Studying for Final Exams, Getting a Better Start to Your Spring Semester, Exploring Majors, and Resume Writing. These programs strive to address academic stressors that many first-time students may be experiencing as they transition into college and can learn about the vast array of resources available to them on campus. Often the Writing Center and Math Lab are in attendance at the programs to connect with students.